The wicked witch enchanted the flower meadow and the poor flowers cannot bloom as the heavy slabs and chains press them down. Help the flower fairy to take the spell away. 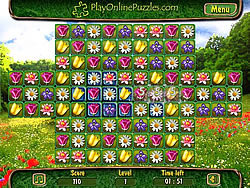 Collect the bouquets of the same flowers, if the number of the identical flowers is three or more the flowers will disappear. Your task is to delete all slabs under the flowers .Some slabs cannot be cleared from the first and some ones are reinforced with chains.